Location: A realignment of the B6298 now follows the course of the line through the site of Crook Station. Notes: Crook Station opened in early 1844 on market days (Thursdays) only with full use of the station by January 1845.
line. Ordnance Survey maps showed this was still in use until the mid 1950's. On 2nd September 1856 S & D minutes record that the building of a new station should be proceeded with but it is not recorded when this opened. The western section of the Stockton and Darlington Railway had been progressively improved and extended with the Bishop Auckland & Weardale Railway finally reaching Crook in 1843. The B A & W company minutes show that the line opened to a permanent station at Bishop Auckland on 30 January 1843, ahead of the rest of the line to Crook and that the generally quoted 8 November 1843 for opening to Crook was for goods only. The line was leased by the Stockton & Darlington Rly. 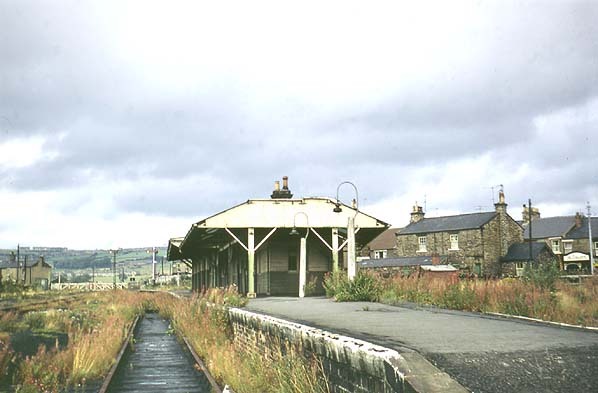 The following stations were proposed: South Church, Bishop Auckland, Escombe, Old Etherley Colliery, Low Bitchburn, Howden and Crook. 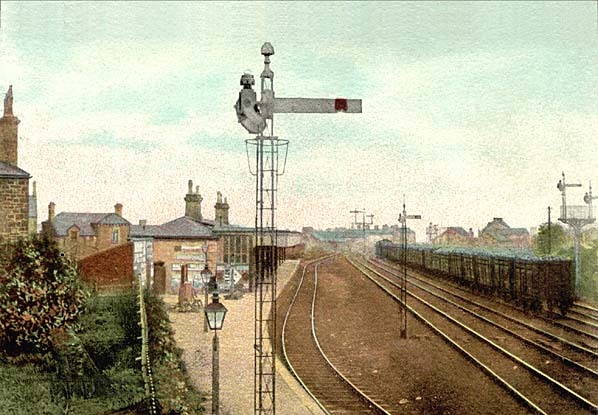 The line opened to a temporary terminus at South Church on 19.4.1842 and extended to a permanent Bishop Auckland station on 30.1.1843. The line to Crook was authorised for opening on 3rd January 1844 but the passenger opening date to has not so far been traced; however, the minutes do show that the line was inspected on 1 January 1844 and that permission to open for passengers was received by on or before 6 January. Escombe and Low Bitchburn stations are never mentioned again and were probably never built. It is likely that the initial service to Crook was market days only because when it first appeared in Bradshaw in July 1844, only a Thursday market service was shown but the line was in full use by January 1845. The Derwent Iron Company was looking for an outlet to the south and itself considered building a line towards Crook and the Stockton and Darlington Railway but in the end it was the S&D who constructed the Weardale Extension Railway from Crook, via the rope worked Sunniside incline to a station at Tow Law joining the former Derwent Railway at Waskerley, at the head of Nanny Mayors Incline where a small railway village developed on the top of the moors. The line was opened to traffic on behalf of Derwent Iron Company on the 16 May 1845; the company subsequently purchased the Derwent Railway. Tow Law first appears in timetables in September 1847; references have been found to additional stops at High Souk (alias High Stoop) and Saltersgate Cottage, which would have been further north towards Burnhill. Although both stations appears on the early Ordnance Survey maps, passenger use cannot be confirmed. The Bishop Auckland & Weardale Railway amalgamated with the Wear Valley Railway in 1847 which was in turn taken over by the Stockton & Darlington in 1858 and by the North Eastern Railway in 1863. On 2nd March 1868 the Sunniside incline was replaced by a deviation to allow locomotove haulage, this required the resiting of Tow Law station. In NER days a through service was provided from Darlington to Tyneside via Bishop Auckland, Crook, Tow Law, Burnhill and along the Derwent Valley Line through Blackhill & Swalwell. With increasing competition from roads and the decline in the handling of lime and stone the line north of Tow Law to Blackhill (Consett) was closed to passengers in May 1939 along with the stations at Burnhill and Rowley ending through running to Tyneside. Shortly after closure the Government built the Salters Gate Ammunition Depot across the line between Salters Gate and Burnhill which effectively totally closed the through line although munitions trains could access the Burnhill Station transfer yard from both directions. 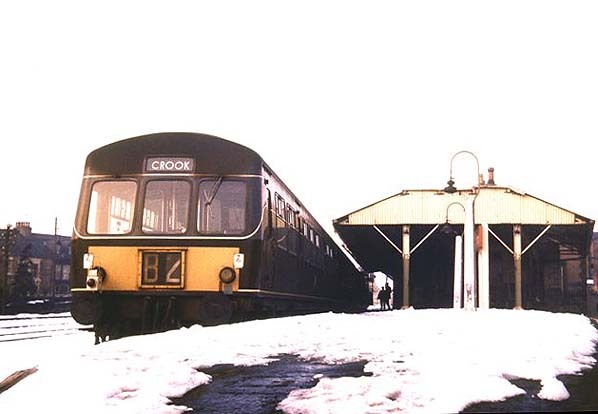 The line was further cut back to Crook on 11th June 1956 and the final section of line from Bishop Auckland - Crook closed to passengers on 8th March 1965. The track north of Wear Valley Junction was lifted in late 1967 or early 1968. The line between Bishop Auckland and Crook served a number of collieries and other industrial sites. Click here for a full list.